The dealer lacks the knowledge or confidence to recommend the technology. The perceived cost is too high. Key to improving knowledge and confidence is to leverage the resources that you already have. A smart dealer is already a member of the WQA and hopefully enrolled in the MEP program, where excellent information about ozone and water contaminants can be readily found. Ozone can be slightly intimidating to some, since it involves more complexity than a typical softener, but as with softeners, if you know enough to get started and have a good support network, you’ll be just fine. Ozone consists of three oxygen molecules and has a very short half-life compared to its diatomic cousin that we all breathe: oxygen. Ozone’s inherent instability is what makes it so very attractive to a water dealer; it works hard oxidizing as much as it can for about a half an hour at room temperature and then quietly fades away into safe, stable O2. This makes it very attractive for oxidative applications like iron, manganese and hydrogen sulfide. Ultraviolet light. Ozone is produced by reacting oxygen with ultraviolet light in the 185 nm spectrum. UV ozone generation has a lower up-front cost and is not very sensitive to ambient humidity, making it ideal for air-handling applications, but I prefer not to use it for residential water projects, since the UV lamp upkeep and sensitive ballasts make it cumbersome and electricity-intensive, compared to other methods. Cold corona discharge. 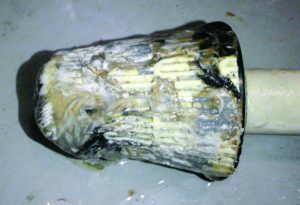 Also known as cold-spark corona discharge or simply corona discharge, it is my preference for residential applications. Simply put, corona-discharge ozone production requires a high-voltage power source, anode, cathode and a suitable dielectric separator. Air passes between the electrodes over a dielectric, creating an electric field, or corona, which induces O2 molecules to rearrange themselves as ozone (O3). Corona discharge produces a much higher concentration of ozone than UV, but is sensitive to ambient humidity. Always strive to maintain a dew point lower than -30°C for optimum performance. For residential applications, it is rare to see liquid oxygen feeds or even oxygen concentrators as you would in commercial and industrial applications. This keeps costs down, makes for a simpler installation and keeps maintenance costs down; however, there might be times that they are necessary, so be sure to discuss the options with your equipment vendor(s) as necessary. One of the first places to wet your feet with residential ozone is where it shines: iron, manganese and hydrogen sulfide—the terrible trio. water can hold significant amounts of ferric iron. US EPA’s SMCL for iron is 0.3 mg/L. Iron reducing bacteria (IRB) feeds on iron in water and presents its own set of unique challenges that can complicate your treatment options. Manganese is far less abundant than iron, but still quite common and easy to recognize from the telltale black staining. US EPA’s SMCL for manganese is 0.050 mg/L, with many states having an action level as high as 0.5 mg/L. The consumption of elevated levels of manganese has been linked to neurological disorders. 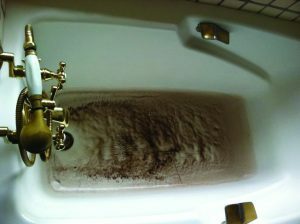 Bathing and showering in water containing manganese has not been shown to pose an appreciable health risk to adults; however, there are very little data on its effect on developing bodies, so it is prudent for pregnant women, babies and young children not to drink water containing manganese. 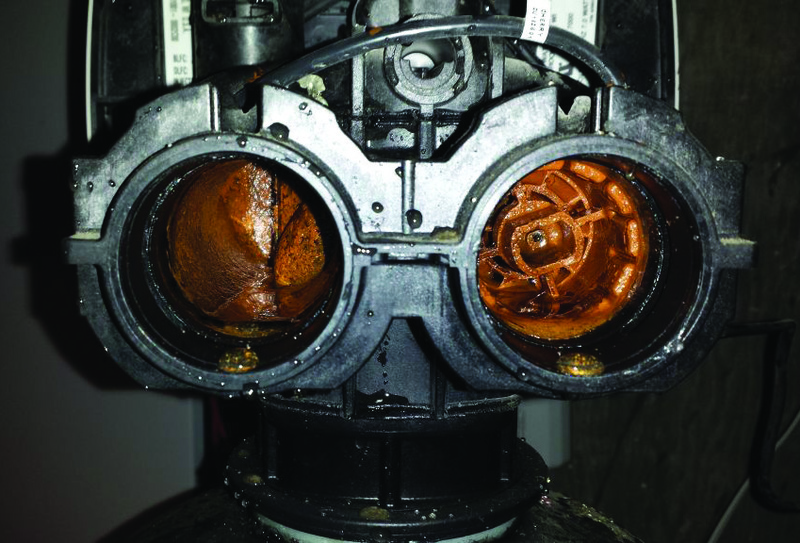 Hydrogen sulfide’s infamous rotten egg smell distinguishes it from iron, manganese and most other contaminants that are found in well water. In addition to its unpleasant odor, hydrogen sulfide concentrations as low as 1.0 ppm are quite corrosive; even very low levels can tarnish silverware and stain porcelain fixtures. It is important to evaluate the water holistically when addressing hydrogen sulfide, since higher pH ranges (7-12) will include other species of sulfur (like sulfide or bisulfide) that do not have odor. Hydrogen sulfide can enter water from geothermal activity, decay of organic matter and, to further complicate issues, various strains of sulfur bacteria commonly existing in groundwater supplies. They eat sulfur and their metabolic byproduct contain hydrogen sulfide gas. Sulfur-oxidizing bacteria will convert sulfide into sulfate and produce a black, slimy biomass. Pay attention if you see the slime and perform the necessary test to ensure that you treat everything properly. The key to establishing an effective water treatment protocol is to understand the nature of the problem, evaluate potential treatment options and ensure it can be purchased, installed and maintained affordably. I also like to test further for iron-reducing bacteria and sulfate-reducing bacteria with a biological activity reaction test (BART) to understand the overall situation better and anticipate interfering biological factors. 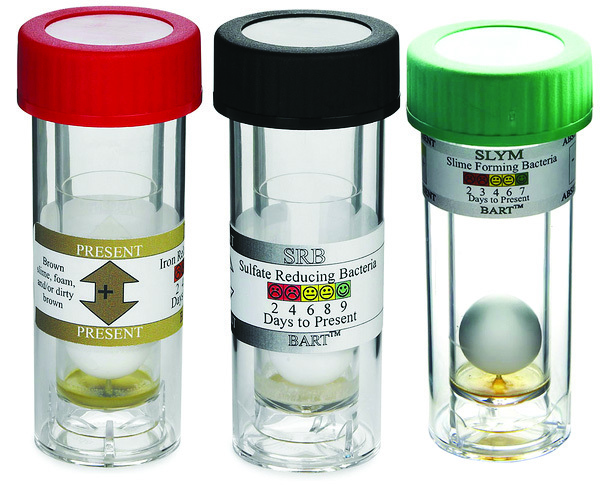 The BART is a simple, safe and effective method for predicting the population size and activity of specific groups of bacteria. A BART test usually takes two to eight days of incubation at room temperature, giving you the flexibility of performing the test without having to send a refrigerated sample to a testing laboratory. 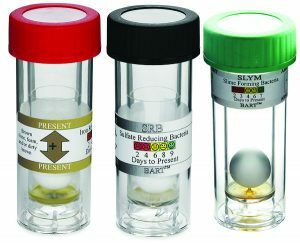 BART kits contain specific sanitary nutrients in the base of a tube where the water being tested will be poured and a ball that will float at the top to restrict the amount of oxygen entering the water column. Aerobic organisms grow around the ball and anaerobic organisms will grow deep down in the water column. Results are determined by observing the rate of change of color of the test (as well as variations in color on some tests) as the microorganisms at the bottom of the water column consume the nutrient mixture. If you observe bacterial activity in the water, understand that this is a significant complicating factor, which will increase ozone demand and might require additional treatment steps outside the scope of this introductory article. In the absence of bacterial interference, water chemistry data will help to calculate the minimum amount of ozone required to provide appropriate treatment. Examples of ozone demand are found in Table 1. Check for alkalinity, hardness and pH in addition to ozone-demanding contaminants. This will help in troubleshooting and predicting potential issues. For example, if the influent pH is < 6.0, it will be difficult to maintain an insoluble precipitate after ozonation. Also, if the total alkalinity and pH are high, then you’ll have a significantly higher risk of precipitate formation on your diffuser or at injection points. Your equipment provider or dealer network should be able to guide you to success when such complications arise. Disinfection and bacterial abatement applications will naturally require a minimum ozone dosage of 0.5mg/L in addition to any other established ozone demand. Multiply minimum ozone demand by L/hr to calculate mg/hr minimum production rate. Divide by 1,000 to determine the minimum grams per hour that the ozone generator needs to produce. Complicating factors will interfere with textbook ozone demand calculations, so develop an appropriate reserve ozone production capacity of 30 percent beyond minimum to allow for flexibility in treatment. It makes more sense to be able to throttle down your ozone production rate than to wish that you had more to work with. The next step is to calculate the volume of retention required to maximize contact time. This is simple: you just multiply the time required by the operating flowrate. If you’re running at 10 gpm and require six minutes of contact time, you’ll need a total mixing/retention tank volume of at least 60 gallons. Strive for a minimum contact time of one minute and maximum of 22 minutes (the point at which ozone degrades into oxygen at normal temperatures). Another perspective is to consider the dosage rate. Dosage rate factors time and ozone concentration to maximize oxidation and minimize cost. For example, a dosage of 0.5 ppm for two minutes is the same as one ppm for one minute and two ppm for 30 seconds. This dosage rate is important when evaluating the type of ozone injection. Once you know what you’re dealing with and the challenges involved, you can begin the process of selecting an ozone injection configuration. Typical residential ozone installations are either atmospheric or in-line designs. If you’re one of the manufacturers or water ninjas out there reading this article who successfully do it differently than what I’m about to present, I understand you, I validate you and you’re special, so bear with me please. This article is for beginners and these are indeed the most common ways to get started in the art. Atmospheric ozone injection can be quite cost effective, especially if the homeowner is already planning on storing water and re-pressurizing it before it enters the home. A significant benefit of working with the outdoor atmospheric tank is that lower ozone dosages can be very effective due to the increased contact time (see dosage rate in the previous section) and the inherent ability of the tank to vent gases and unused ozone. Some dealers will introduce raw water into the tank through an aerating head to further assist in the oxidative process. 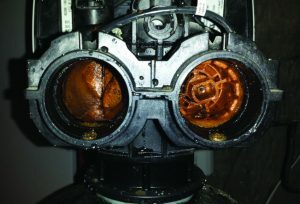 A significant disadvantage of the atmospheric tank is that insoluble precipitates will form at the bottom of the tank, necessitating periodic tank cleanouts. Further, if the tank installation does not include sanitary venting and protection of animal/insect ingress, it can become a source of bacterial contamination. Air pump. Sized to generate the pressure and flow needed to deliver the ozone to the desired point. The air will be pushed through an optional dryer, through the generator and then all the way to the tank where it will rise to the top and plunge down to the bottom where it exits the diffuser, so take this into account and size accordingly. Ozone generator. The generator is sized according to manufacturers’ guidelines along with your calculations. Don’t be shy to discuss each application with your vendor to get a second perspective, which helps to minimize potential problems. Distribution tubing. One of the most common mistakes made in ozone installations is to use the incorrect tubing after the ozone generator. Remember, ozone is a very strong oxidizer and will destroy rubber, vinyl and polyethylene fittings and tubing over time. Stick with proven tubing, like PVDF, FEP and PTFE. Always use the style and type of fitting that the tubing manufacturer recommends for the application. For example, most PVDF tubing manufacturers only advise barbed fittings, where PTFE can be used with barbed or compression fittings. Kynar and stainless steel are common fitting materials and can be quite costly, so remember to include this along with the higher cost of compatible tubing when bidding ozone projects. Ozone diffuser. The diffuser is where the ozone meets the water and is critical to your success. This is not a place to cut costs. Use a diffuser made of materials compatible with the ozone concentration and the chemistry of the water that you’re treating. Go for one that generates extremely small bubbles to provide ozone contact. Depending on the tank diameter and amount of contact required, you might consider multiple diffusers in the same tank to ensure sufficient contact area. When there is no space for atmospheric injection or the ambient temperature precludes it, an in-line injection design is appropriate. In-line injection requires a faster rate of ozone production and suitably designed injection, mixing, contact and ozone destruction. The preparatory steps are exactly the same as for atmospheric injection, with an air pump, air dryer, ozone generator and distribution tubing. The difference arises with prefiltration, injection and contact times. Prefiltration. Protect your injection system, mixer(s) and contact tank(s) from sediment and foreign material with a prefilter in the 30-50 micron range. This will make everything work better. Check valve. While check valves are important on all ozone installations, it is critically important to incorporate at least one ozone-compatible check valve on a direct injection system after the ozone injector to prevent contamination of the ozone injection loop with water. Make sure its seal material and cracking pressure are compatible with your application. Injection. The injector type and location are important for ensuring that you inject as much ozone as possible into solution. Size the Venturi injector according to manufacturers’ specifications and plan on installing it so that it can be properly and easily accessed for periodic maintenance and cleaning. Static mixer. Static mixers allow for significantly improved contact between the ozone and the solution to be treated and are well worth the expense. Ozone contact tank. A properly sized contact tank further ensures an appropriate ozone dosage, while allowing off-gassing to an ozone destruct system and then to atmosphere. Ozone destruct. Unused ozone in the contact tank indicates that there is sufficient ozone to fully oxidize the contaminants or, more commonly, insufficient contact time in solution because the contact tank is undersized. The contact tank vent that releases excess gas can be routed to an ultraviolet or catalytic ozone destructor that will force it to revert back to the diatomic oxygen that is found in normal, ambient air. Once the target contaminants have been oxidized into insoluble precipitates, it’s time to take them out. This can be effected with cartridges, bag filters or even a self-backwashing multimedia filter. Budget, required flowrate and the volume of precipitate to be removed will help to point you in the right direction. Think about the size of particulate to be removed and don’t be shy to perform jar tests to establish the appropriate filter pore size that you will need. It is also very important to plan for redundancy by installing parallel, identical filters or stepwise series filters. The most common method I see is a self-backwashing, multimedia depth filter followed by a one-micron postfilter, which ensures maximum removal of precipitates, while retaining the ability to properly clarify the water. Be careful to prevent bacterial contamination of the postfilters through good design, safe handling and disinfection procedures. It is sometimes appropriate to also soften the water at this point and then radiate with germicidal UV to provide adequate protection to the home and its occupants. Naturally, even the best-designed system will fail if improperly installed. Make sure that you follow industry best practices while adhering to prevailing local codes. Make smart decisions about locating equipment from excessive humidity, direct rain, direct sunlight and freezing conditions. Dry, clean, cool equipment works the very best. And don’t forget about your client once you’ve been paid. Instead, plan on returning within 30 days after installation to re-test the influent and effluent water and confirm that everything is working as advertised. Discuss a sensible, preventative maintenance plan with your client to help ensure that the system is properly maintained and that you are able to best serve them. Plan on visiting your client at least annually to check on the system and ensure that their water is the way that they expect it to be. Unlike OSHA, National Institute for Occupational Safety and Health (NIOSH) standards are not enforceable under US law, but they do usually have a strong influence in forming future policy and regulations. The NIOSH-recommended exposure limit for ozone is 0.1 ppm. According to NIOSH, ozone levels of five ppm or higher are considered immediately dangerous to life and/or health. A good rule of thumb is that if you can smell ozone, then the concentrations are high enough that you should immediately evacuate the area and properly ventilate before returning to work. Give ozone a try on your next well water treatment project. I think that you’ll be pleasantly surprised. The Use of Indicator Organisms to Assess Public Water Safety, Hach Company, 2000. 2012 Edition of the Drinking Water Standards and Health Advisories, EPA Publication # 822-S-12-001, US EPA 2012. Ozone–The Practitioners Guide, Innovative Water Project 2014. Greg S. Reyneke is Managing Partner at Red Fox Advisors, a multidisciplinary research, development and consulting company with a strong emphasis on water, air, microbiology and energy projects. He also serves as an advisor to the ProFlow Dealer Network, a Pentair Platinum Partner and is a member of the WC&P Technical Review Committee.